Ich sammle seit einigen Jahren Spam-E-Mails. 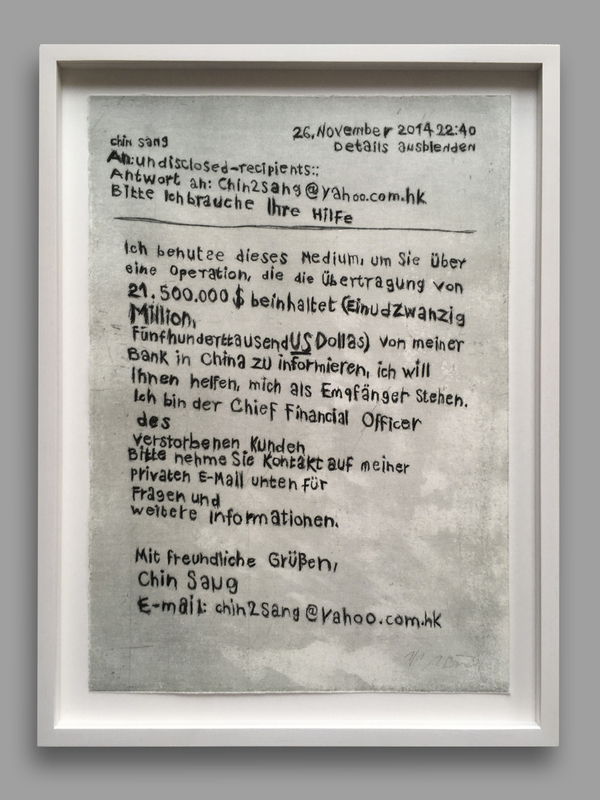 Das sind scheinbar private E-Mails, die ich von Bankdirektoren, Diplomaten, Prinzen, Ölscheichs, Anwälten, einsamen Witwen, etc. bekomme. ”Hope“ als Titel, weil sowohl der Betrüger als auch der Betrogene zunächst auf Geld hoffen (Das nennt man dann Winn-Winn-Situation). Spam ist ein Phänomen, das niemand haben will, das nervt und in Masse produziert wird. Ich schaffe einen maximalen Kontrast zwischen dem, was es ist (wertlos) und dem, was ich daraus mache: ein hochaufwändig produziertes Unikat. For several years I have collected spam emails. They are seemingly private emails that I receive from bank directors, diplomats, princes, sheikhs, lawyers, lonely widows, etc. I chose the title “Hope” because both the defrauder and the defrauded are primarily hoping for money. Spam is a phenomenon that no one wants, that frustrates, yet is still produced on a huge scale. With this artistic statement, I succeed in creating a maximal contrast between what spam actually is (trash) and what I make of it: an intricately produced unicum. I use this medium to guide you through an operation that involves the transfer Of $ 21.5 million (Twenty-One Million, Five Hundred Thousand US Dollars) from my bank in China, I will help you, Me as a receiver. I am the Chief Financial Officer of the Deceased customers.